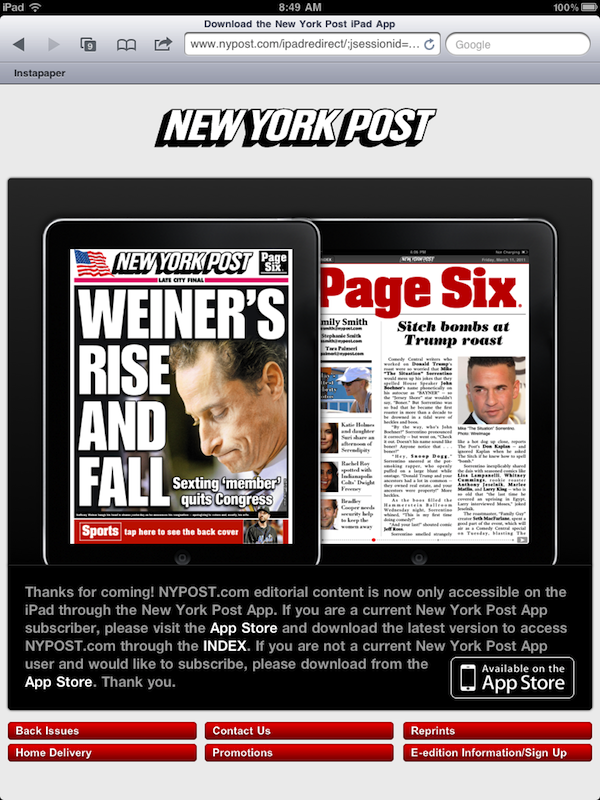 The New York Post has joined a growing number of publishers who are forcing readers to pay to download their app version of their publications, shutting the door to free access on certain devices like the iPad. Subscriptions through the app run $6.99 per month, $39.99 for six months or $79.99 for the year, with no option for single-issue digital purchases. A number of major publications are now going this route of paid access to their content. Conde Nast has taken nearly all of their publications to a “pay for app” access model via the iPad with publications such as GQ, Wired, and The New Yorker. I’m of the opinion that the “pay wall” for content access is not something that will be sustainable for the longer term with these publishers. It seems there are far too many publications out there that are offering their content for free, which gives readers other options, as opposed to having to pay for content. People come to the web for free content, for the most part – at least that’s the way I see it. What do you think about the “pay wall” that publishers are creating, forcing readers to pay for apps to access content?